The in-progress Skywalk project connecting two New York historic sites is the subject of a public meeting tonight in Greene County. Earlier this year, Governor Andrew Cuomo announced the creation of the Hudson River Skywalk Region. A $14.6 million Skywalk will connect two landmark historic sites – Olana State Historic Site in Hudson and Thomas Cole National Historic Site in Catskill. Olana Partnership President Sean Sawyer says the current view is "already spectacular." 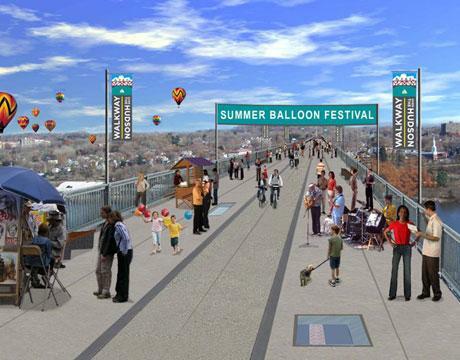 "It's a bridge/pedestrian walkway that has existed and now is expanded, that piece is done. But there has never been a way for pedestrians to get to the bridge without driving their cars to one edge of the bridge or the other, getting out, crossing the highway and getting on to the walkway. So this should make it much, it will make it much easier for people to utilize that and make that connection." Betsy Jacks is Executive Director of the Thomas Cole National Historic Site. "Right now we have a beautiful bridge that crosses the river. And it's kind of a secret in a way. It's one of the most magnificent experiences in the area, and there are very few people that know that the Rip Van Winkle Bridge has a pedestrian walkway. And I think that's largely because it was so difficult to access it. There was not an obvious place to park. And when you get to the other side of the bridge, whichever side that is, it doesn't go anywhere else. So, all that is going to change this fall. By the end of this fiscal year, by the end of December, the county, the state and all these different partners will have built walkways that extend the bridge walkway on the west side of the bridge, righ to the Thomas Cole National Historic Site, and on the east side of the bridge, right to the Olana State Historic Site. So it will be a bridge between two magnificent places. And the bridge itself is a magnificent place." A pedestrian-friendly roundabout will provide tourists with a direct connection from the east end of the Rip Van Winkle Bridge to the Olana State Historic Site. 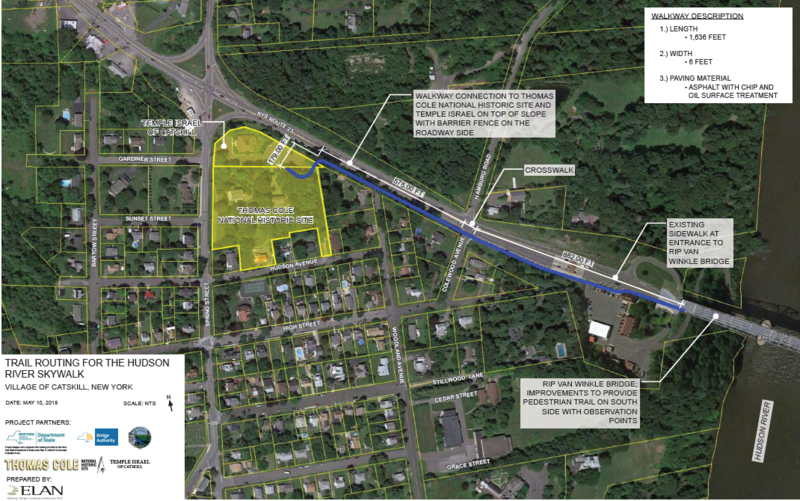 Greene County was awarded $875,000 through the Local Waterfront Revitalization Program to design and construct a sidewalk from the Cole site to the Rip Van Winkle Bridge that will be completed in the fall. Jacks points out that "The bridge is existing, the walkway is existing, but it was an underutilized resource. And the Bridge Authority recognized this." 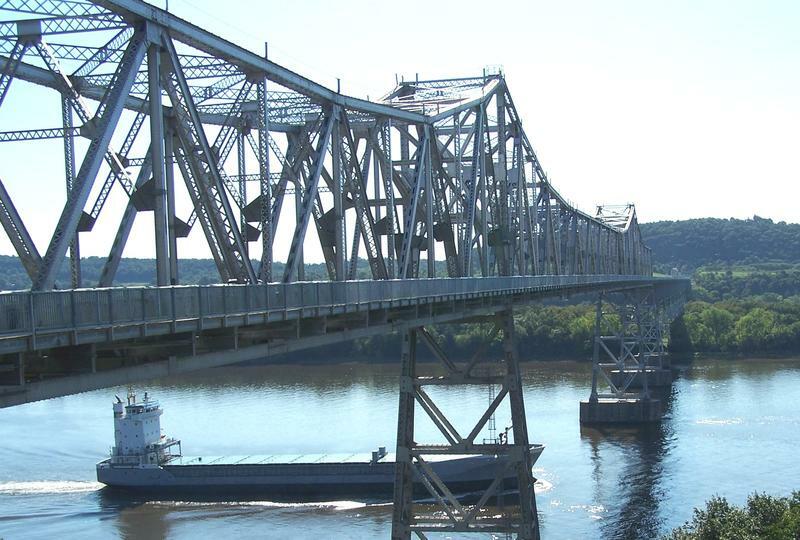 The New York State Bridge Authority provided $5.4 million to rehabilitate and rebuild the entire pedestrian walkway and railing along the Rip Van Winkle Bridge, while adding three new scenic viewpoints. "They are a widening of the walkway, on three places, 50 feet long balconies that overlook the Hudson River and the Catskill Mountains and this incredible view. They're going to be installing benches there so that along the way you can have a pause and just take it all in." Greene County Director of Economic Development, Tourism and Planning Warren Hart did not return a call for comment. He told Columbia-Greene Media that final survey work is being completed for easements. A final bid package for the balance of the construction will be released this summer, and construction is expected to resume in September. Although concerns have been raised against installing a traffic circle, Jacks says it will mitigate the dangers of the current configuration. Jacks says "We call it the 'spaghetti junction' because there are roads that come in from all different directions and it's hard to figure out which way to look when you cross them. You don't know whether to look right or left, and there's yield signs and there's stop signs. It's not very efficient nor clear. And replacing that with a traffic circle, which will slow everybody down, I think it'll just really clarify and improve the safety of that intersection." The public meeting begins at 6 p.m. at the Washington Irving Senior Center in Catskill. The Skywalk project is a partnership between Greene County, NYS Department of State, NYS Bridge Authority, Village of Catskill, Thomas Cole National Historic Site, and Temple Israel of Catskill. An Economic Impact Analysis and Tourism Market Study have been completed for the Skywalk which is expected to enhance the local tourism industry by attracting new visitors and increasing visitor spending and job creation. New York Governor Andrew Cuomo Tuesday announced that grant money will enable the next steps in building the Hudson River SkyWalk, a pedestrian trail linking two historic sites across the Hudson River.